Garden weddings are timeless and whimsical events filled with various perfumes of spring blossoms and fruits of summertime passion. 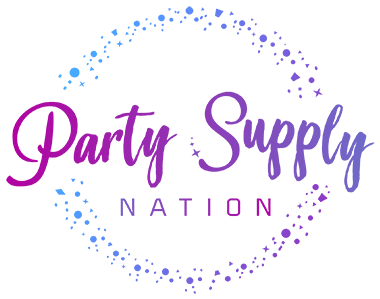 For many, seeing lovely couples tie the knot during a time of love, joy and new beginnings makes these events well worth the invite. And what better way to invite your guests to this secret garden than with these 15 breathtakingly beautiful garden wedding invitations! 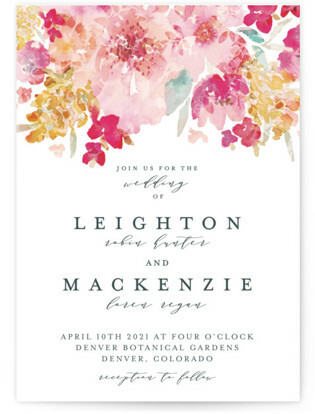 A spring garden wedding just wouldn't be complete without this floral watercolor wedding invitation. 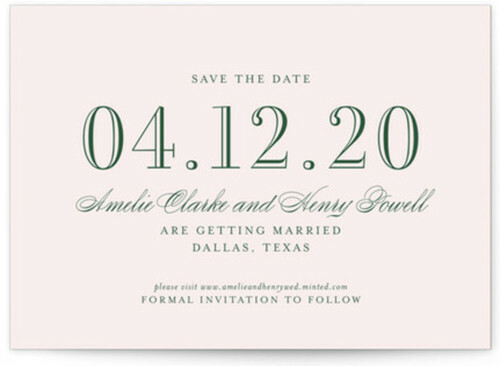 With pastel pink flowers and classic font, this is the perfect invitation for any blushing bride's special day. With each new day, your love definitely grows for the ones you love. 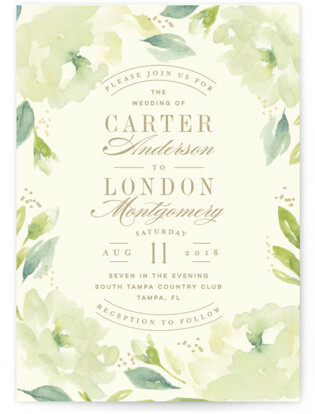 So why not show it off with this wonderful garden wedding invitation! “A rose by any other name would smell as sweet” as this eye-catching garden wedding invitation. A lovely, rose garden border with a vintage design that will be always remembered. For those cute, romantic couples wanting something unique, try carving this tree with your initials in this wonderful garden wedding invitation! This midnight garden wedding invitation will bring a whole new meaning to midsummer night with its combination of flowers, stars, and love of the bride and groom. For a traditional fairy-tale spring wedding, we present you with the perfect gilded garden foil wedding invitation that gives you an air of rosy elegance. If you are wanting a floral design that keeps it simple with a gentle spring theme, then this is the perfect garden wedding invitation for you. 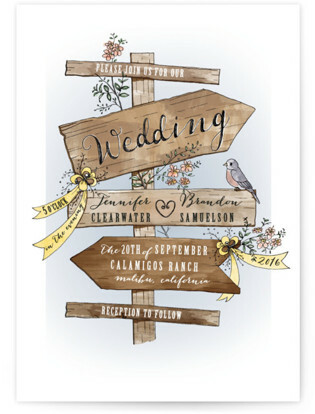 Need a garden wedding invitation with a sense of direction? Look no further, for this lovely design gives you a creative way to guide your guests to your dream garden wedding. 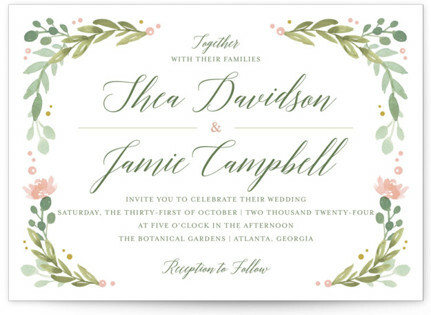 For the southern belle at heart, this garden wedding invitation is the perfect way to give your guests a rustic view of the traditional magnolia blossoms with a touch of class. Give your guests this mythical garden wedding invitation for your special day. With its wisps of golden foil writing, your guests will surely feel enchanted by this secret fairy garden. Give your wedding invitations the perfect Midas touch with these golden roses and an airy inscription for your guests to adore. With a painted floral arrangement and simple print, this garden wedding invitation is great for bride's wanting an artistic take on spring and all its splendors. This vintage garden wedding invitation is a classic and timeless choice for anyone wanting something that is both unique and vibrant. 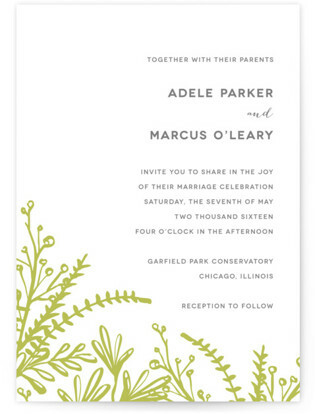 A little spring green and simplicity makes this garden wedding invitation great for any spring or summer themed wedding. With all the romance in the air, this list of garden wedding invitations just wouldn't be complete without a little taste of Paris!